For this edition of the Top 5 Movie Guide, we turn our focuses to one of the elements of this weekend's "Trouble With the Curve", and compile some of our own favorite baseball-themed movies! Baseball has long been considered our national pastime, so it only makes sense that it would be a frequent topic in the world of film. There have been a number of movies centered around this great game throughout the years, from nearly every different genre imaginable. And since baseball's monumental rise in popularity over the 1930's and 40's, there's been no avoiding the subject. You'd think that for a sport played at such a leisurely pace, it wouldn't necessarily spell cinematic success; but I guess that's the beauty of the sport, and what keeps fans coming back for the movies time and time again - the exact same game that can seem so simple and so flat to some can also have more complexities than you can wrap your head around. It's as intricate as you want to make it, good for the casual fan just out for some sun and a beer, to the stat-obsessed intellectuals who create new math equations simply for determining player ratability. The game draws such broad crowds, and that audience only grows when the magic of movies is used to capture the essence of the sport. Only time will tell if "Trouble With the Curve" will may make its way onto any of these lists, but until then, here are the films we see as the best baseball movies around! Before we start with the lists, we want to take notice of a special guest list-maker we have featured this week - Dan Foutch, cousin of our very own horror expert, Ben Foutch, stepped in to help us out. With his insights on movies and skills in writing, he is a valued addition to this post, and we hope that down the road he'll be a more regular contributor. Be sure to catch all of his picks further below! One of the toughest lists I've ever compiled. Baseball is one of my biggest passions in life, and there have been so many great movies over the years themed around the sport. This list might be the epitome of my favorite things in life - a list ranking movies about baseball. Does it get any better than that? Such a tough call between this and my next selection for the top spot, but ultimately I went with this one because it has more to do with the game of baseball than "Field of Dreams". 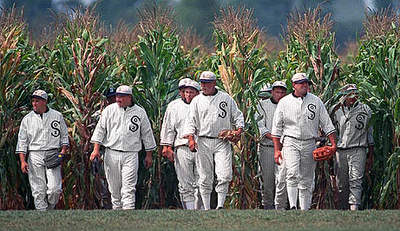 Great themes here, and Kevin Costner's character is so perfect as an aging minor leaguer. I love every aspect of this movie; I feel like it is about the best representation of the game itself that I've ever seen on film. How can you not love this movie? It gets better the older we get, and I'm not sure there's a better example of a film about faith, hope and family out there. Just a great heartwarming story that also has some really great baseball elements to it. Plus, Kevin Costner owns this list! This will probably never be able to climb any higher than this, but this was still a great watch - and my favorite movie of 2011. I love the old school vs. new school themes presented, and the love shown for the game felt so honest. Plus the score and cinematography really stood out - it can be hard to film sports movies, but this one did one of the best jobs I've ever seen. At one point I had this as my #1, just because it's so simple and pure. It recalls the better days, when we were all just kids playing baseball in the backyard. The stories all change a little, but we all had these experiences. It tries to be a little too silly at times, which keeps it from holding up quite so well as an adult, but there are plenty of great heartfelt moments too. Every kid should watch this movie. This is a silly adult comedy, but such a fun one. There's still some good heart in this film, and a great sense of team comradery. Who doesn't want to root for this group of misfits? Charlie Sheen was born for this role, and Wesley Snipes is a great addition as well. This is always an enjoyable watch; you can't go wrong here. The late 80's-early 90's gave way to some great baseball films. Guess I'm a slave to that period in time. So, in the spirit of baseball being America's pastime, this list is heavily based on Nostalgia. If you haven't seen any of these, or even if you have, make sure to grab a beverage and a salty snack while you watch them, in honor of the game. By all of the Cleavland Indians apparel I own, you'd think I was a die-hard Indians fan. I'm not, I'm just a fan of this movie. "Hook' is not only my all-time favorite movie but also the movie I've watched the most in my life. This movie probably comes in a close second in the most watched category. So many emotions in this movie. One moment you're cracking up, the next you're tearing up.Great characters and performances all around. A nice calm background movie. I really enjoy putting this one on and letting it wash over me. Very soothing. Sometimes I think this should have won the Oscar for Best Picture over Mrs. Miniver. Even though I hate the sport, they definitely translate to good films. Arguably my all-time favorite childhood movie. I appreciate this film more and more the older I get. It's funny that Gary Busey is by far the least ridiculous aspect of this movie. This movie actually has some pretty dark themes in it; still a great film from my childhood. I feel like Kevin Costner should be in the baseball Hall of Fame just for all of the movies he's made about the sport. I’m not a huge baseball person and haven't had the time to devote to being an avid fan. As a child however, I was a much bigger fan. That being the case, my Top 5 are heavily biased towards nostalgia and not necessarily quality. Sports movies are fun, there’s often an underdog and in the end they come out on top; Americans eat that up with a spoon. This wouldn't be the Top 5 I would have chosen for my debut but I’ll give it a swing (pun intended). Please don’t judge too harshly. Yes, it’s about women’s baseball (deal with it), but it's really well done with spectacular performances by the likes of Tom Hanks and Geena Davis. The Rockford Peaches are the penultimate underdogs; they’re women in a male sport and they’re an underdog team. Another underdog film. This time with the zany antics of Charlie Sheen, Corbin Bernsen, and Dennis Haysbert. ‘Wild Thing’ is a perfect fit for Charlie Sheen. Yet another underdog movie (are you noticing a trend yet?). A group of rag tag outcasts on a crappy baseball field and their misadventures with terrifying dogs, luscious lifeguards and other grade school shenanigans. 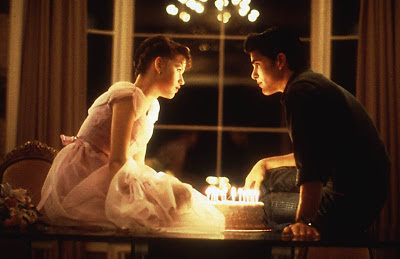 This movie is rife with nostalgia for me. What baseball movie list would be complete without this one? This is arguably the most iconic baseball movie out there. I don’t think I need to say anything about it. Every child fantasizes about having a super power; an incredible fastball may not be what comes to mind for most, but a kid getting to play for the Cubs? Where do I sign? So there we have it. Plenty of great titles listed above, but for a genre so full of quality material, it wasn't too hard to assume many of the repeat offenders this week. The only film appearing on all five lists, however, was "Field of Dreams". Adding in supernatural elements around strong family values, this is a great film that everyone can (and should) enjoy. Surprisingly, for being the only film to appear on every list this week, it didn't earn any #1 selections. Still, as a composite selection, it's hard to argue this being the best all-around option. We had two films this week with four selections: "The Sandlot" and "Major League". The humorous aspect here is that these fall on complete opposite ends of the spectrum - the first being a pure children's movie and the other an adult-oriented comedy. Both clear favorites amongst a mass of quality titles for this group, and two really great selections highly deserving a watch. Rounding-out the films with multiple selections, "A League of Their Own" was the only one with three, while "Bull Durham" and "Rookie of the Year" were the only films with two. All fun watches, even though it seems pointless stating that these are priority watches, because as this is such a strong category, most selections listed above are such this week. In closing, we'd like to note and thank Dan for his contributions this week. A newcomer to to the top five arena, we hope that over time Dan will be a more regular member of this post, possibly even providing more content for the site altogether. But for now, we commend his efforts and insights this week, subbing in as our guest list-maker! So as always, we hope that each of these selections helps you to expand your knowledge and appreciation of some of the best films that this category has to offer, and guides you to better and more enjoyable all-around viewing experiences.